The difficult years of the Depression had begun, and despite the hard times, Hedblom had resigned from his job at Bethlehem Steel (the company which had taken over Atlantic Works) following a dispute with company management. He and his father began looking for space in East Boston to use as a machine shop. They spotted a vacant space in the old Bertelsen & Petersen yard where they had worked for many years. An appointment was made with Mr. Bertelsen - and following a pleasant visit, an agreement was reached allowing the Hedbloms to use the property rent free until they turned a profit. Their company - General Ship & Engine Works was formed the very next week. Around this time, the Hedbloms hired two men who would be important members of the team at General Ship & Engine Works - Arnold Nielsen and Carl Roessler. Carl, a Woburn neighbor, would marry Byron's sister Ruth in 1934, and become the company's Works Manager. The General Ship & Engine Works crew during the construction of "The City of Burlington." Carl G. Hedblom (father of Byron Hedblom) stands to the right with his hat in his hand. Third from the right in the first row is Carl Roessler. 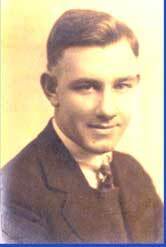 In late 1936, Paul Bertelson came to see Carl and Byron Hedblom to tell them he needed to considerably raise the rent on the shop. A deal could not be reached, and General Ship & Engine Works learned that they would have to vacate the premises within 30 days. With several important contracts pending, the Hedblom Father-Son team had to move fast. They purchased a waterfront property on Border Street in East Boston consisting of a large piece of land with two wharves and no buildings except a three-story dwelling. A short time later, old pilings were uncovered which led to the discovery that the shipyard's new home had an illustrious hitory. It had once been the home of Donald McKay's shipyard where the great Clipper Ships like the Flying Cloud were built. 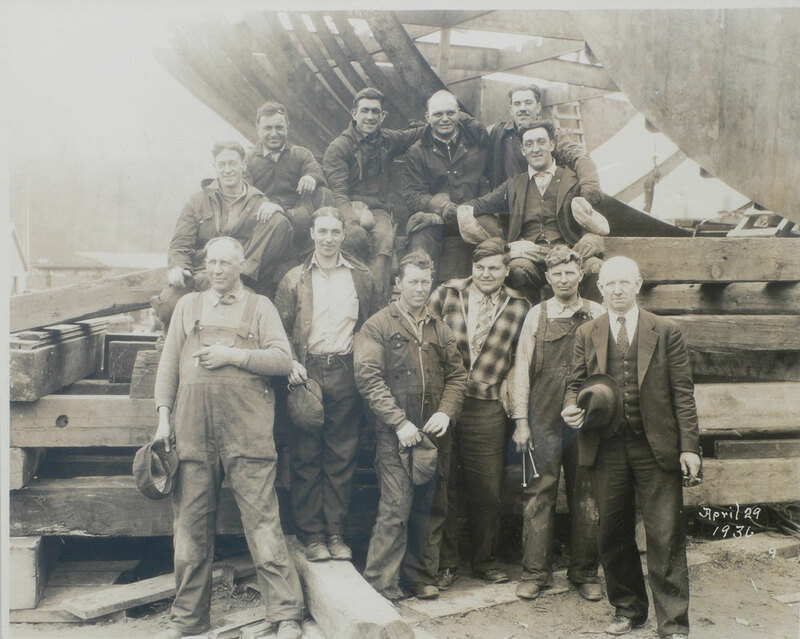 "When the newspapers got wind of this fact, they gave a great deal of publicity about the rejuvenation of the Donald McKay shipyard," Hedblom later recalled. 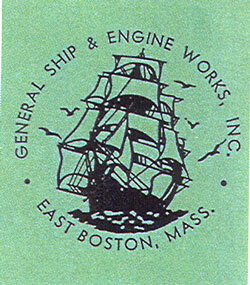 Boston General Ship & Engine Works adopted the image of a Clipper Ship as its logo. In 1937, General Ship & Engine Works successfully competed for a contract with General Motors Corp to build the New York Electric Ferries. 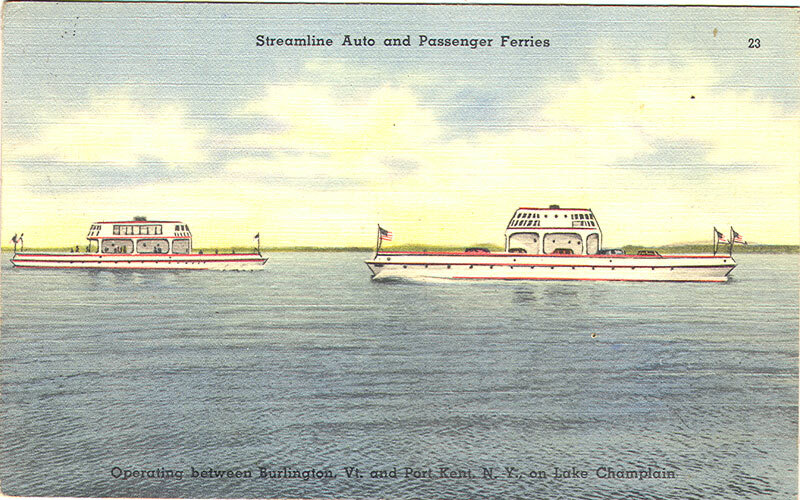 The two ferries were outfitted with General Motors engines, and were completed in 1942. Boston Mayor Maurice Tobin, attended the laying of the keel ceremony for the ferry "Hudson" and welded his name on the ship's keel. - Read More on the New York Electric Ferries page. In 1939, over the Christmas Holidays, the famous old side wheel steamer Mt. Washington burned at the dock at the Weirs, Laconia, New Hampshire. The Captain, Leander Lavallee contacted General Ship & Engine Works about building a replacement ship. Read More on the Mount Washington pages. 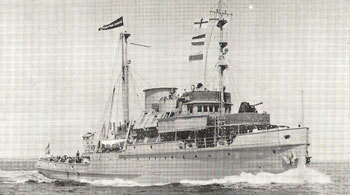 The V4-M-A1, a 186-foot oceangoing tug, of which 49 were built, was the largest V-tug built during WWII. Great Isaac Apr-44 Sank 1947: Today it is a popular New Jersey Coast Diving Attraction! In 1941, General Ship and Engine Works received an invitation from the U.S. Maritime Commission to come to Washington to receive plans and specifications for the construction of five super ocean going tugboats. 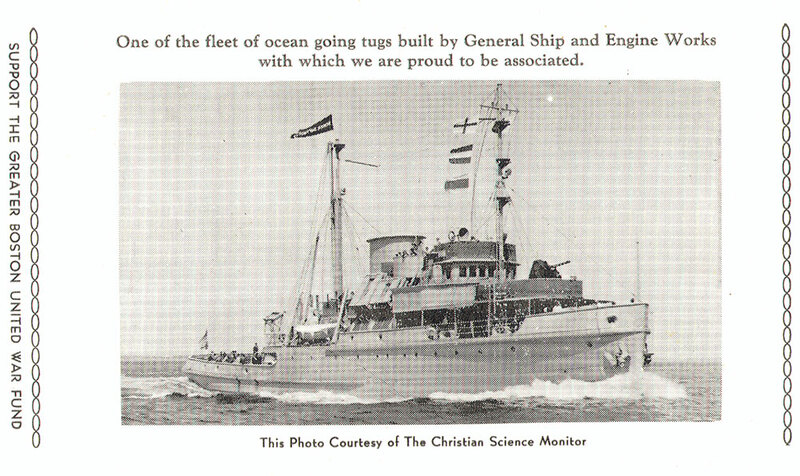 These were to be part of a group of 50 tugs built in ten different yards as part of the war effort. The General Ship & Engine Works bid was successful, and the company was granted a large contract that required larger facilities and more staff than they currently had. In 1942 the company incorporated as General Ship & Engine Works, Inc.. At the same time, the Lake Winnipesaukee operation was separated from General Ship & Engine Works and set up as a new Corporation: The Winnipesaukee Steamship Company. List of some of the Boston Based Companies appearing in the General Ship Associates brochure for the Annual Dinner and Dance, November 4, 1944 at the Copley Plaza Ballroom.